For all the people suffering from depression, anxiety and for those going through a heartbreak or some difficulties in your life. 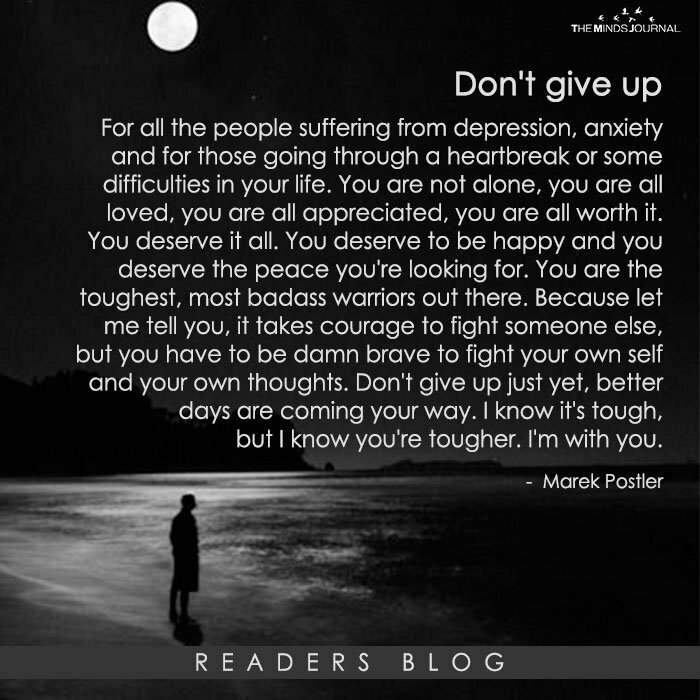 You are not alone, you are all loved, you are all appreciated, you are all worth it. You deserve it all. You deserve to be happy and you deserve the peace you’re looking for. You are the toughest, most badass warriors out there. Because let me tell you, it takes courage to fight someone else, but you have to be damn brave to fight your own self and your own thoughts. Don’t give up just yet, better days are coming your way. I know it’s tough, but I know you’re tougher. I’m with you.